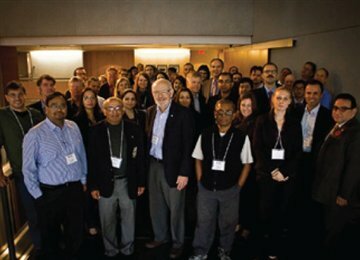 RES’EAU-WaterNET brought its annual meeting to Toronto in November, 2012, gathering researchers, highly qualified personnel, partners and invited guests to mark the network’s progress to date—and plan its future. Day 1 featured summaries and progress updates from each of RES’EAU’s core research themes, as well as keynote and guest lectures on topics closely related to the network’s mission. These sessions are highlighted in the PDF download below. Day 2 focused on building consensus among researchers for the next phase of Natural Sciences and Engineering Research Council (NSERC) Strategic Network funding, which was awarded in January, 2014.